What is a Tilt Skillet? 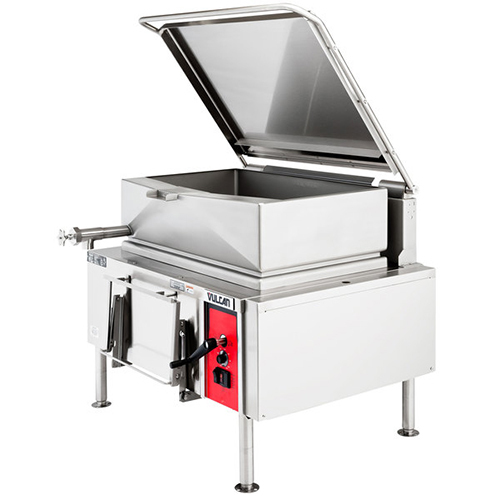 A tilt skillet is a versatile piece of commercial cooking equipment that allows the user to prepare a variety of foods in large batches. Also known as a braising pan, the tilt skillet can be used to fry, simmer, steam, saute, or grill. The most unique feature of a tilt skillet is the ability to tilt the braising pan forward to transfer foods into storage containers or serving dishes. How Does a Tilt Skillet Work? Similar to a grill, a tilt skillet has control dials for setting the cooking temperature. But unlike a flat top grill with one cooking surface, the tilting skillet has a large pan with cooking surfaces on the bottom and side walls. Thanks to this feature, large quantities of ingredients can be added to the braising pan without overcrowding because they will cook from all sides. As the ingredients are cooking, the included lid can be placed over the braising pan to reduce heat loss and save energy. When the ingredients are cooked, a lever allows the operator to tilt the braising pan forward and lock it into place. Foods can then be quickly and neatly poured into a separate container. This is extremely useful when transferring large quantities of food. Prized for its versatility, a tilt skillet can do the work of several pieces of cooking equipment. Frying - The braising pan can be treated like a large frying pan and filled with oil for frying chicken or other items. Steaming - By adding water to the bottom of the basin and closing the lid, you can steam a wide variety of foods like vegetables and rice. Grilling - The tilt skillet can grill anything you would normally put on a flat top, including eggs, bacon, pancakes, vegetables, and much more. Simmering and Boiling - Liquids can be simmered or boiled in a tilt skillet, allowing you to cook pasta, soups, and stews. Sauteing and Braising - Best known for its braising abilities, the tilting skillet can braise large quantities of meats. Holding and Proofing - The braising pan can even be used for holding, thanks to its great temperature retention. Tilt skillets offer an efficient means of cooking large batches of food, which makes them especially useful for commercial kitchens in schools, hotels, and hospitals. Not only limited to high-volume cooking, tilt skillets are also available in countertop models with smaller capacities. You can reap multiple benefits by adding a tilting skillet to your kitchen. Anyone on your staff can operate a tilt skillet. They're extremely safe thanks to the tilt mechanism, which allows the user to transfer hot foods without contact. Because the pan tilts forward, tilt skillets are easy to clean. Oil and grease can be drained off and the skillet can be sprayed down. Many tilt skillets come with an attached faucet for easy filling. Tilt skillets heat up very quickly and cook foods without much heat loss, which saves you money on utilities. They also offer an all-in-one solution because they do the work of multiple types of equipment. 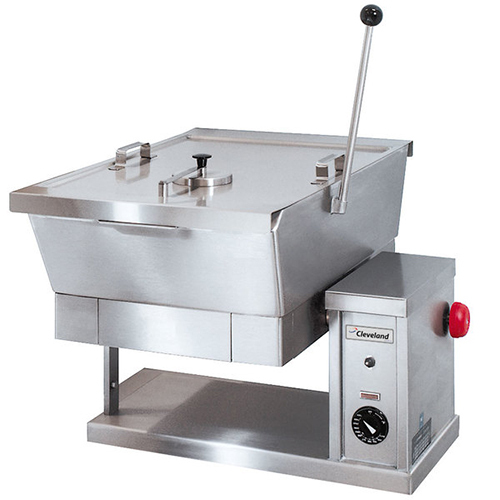 Even though they are designed for cooking large batches, a 40 gallon capacity tilt skillet still only takes up a relatively small footprint. Countertop units take up even less space, making them perfect for smaller kitchens. Tilt skillets allow you to cook foods and transfer them quickly without any messes or spills. 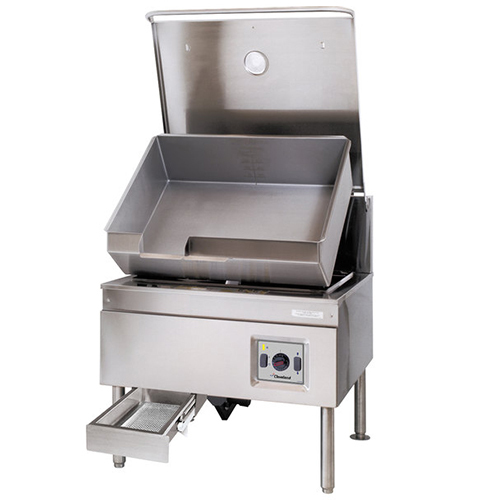 Compared to a flat top grill, a tilt skillet is self-contained and much more efficient. You can simplify your kitchen processes and boost your productivity by investing in a braising skillet for your kitchen. So, you've ordered a new piece of commercial kitchen equipment and it’s now ready for delivery to the site. As an equipment buyer, have you done all of your homework to make sure that the installation will go as smoothly as possible, and that the equipment will work properly from the get-go? If you think you have everything in check, then take a look at the following list of "must do" tasks, to ensure that there are no surprises when it comes time to install your new equipment.